Inspired by the colours of summer, Totem 006 by Tom Pigeon is an exclusive neckpiece designed for Local Heroes. Tomato red resin sits beside bright brass and clean white marble Corian; crisp glass-effect acrylic and mint cotton cord – a playful combination of textures, materials, and shapes. 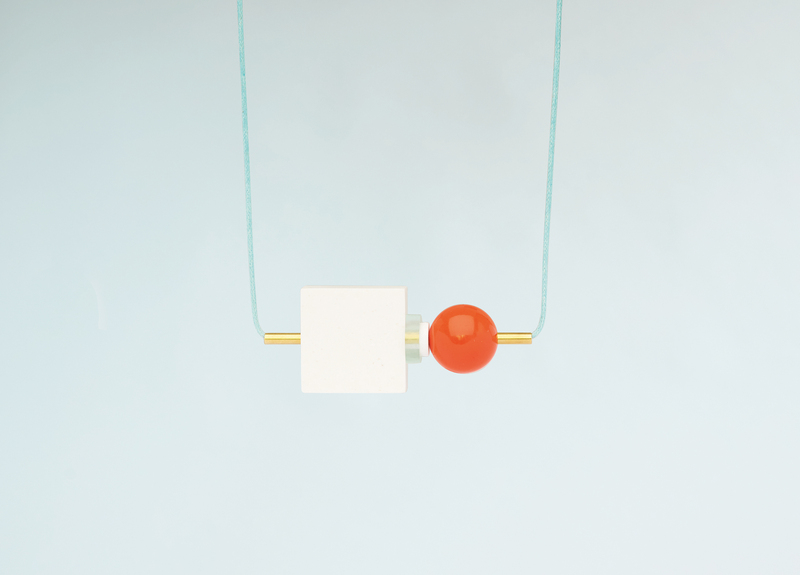 Totem is part of a collection of playful Post-Modern jewellery inspired by the wit and humour of the Memphis movement of the early 1980s including the technicolor furniture and objects of designers Ettore Sottsass and Nathalie du Pasquier. These post-modern playthings combine a palette of mixed materials to create a striking necklace that can be worn assembled or deconstructed. Totem 006 comes in white marble Corian, tomato red and mint. This piece features a polished brass tube, solid Corian block, bespoke discs of glass effect and white acrylic and a red resin ball. The necklace has an adjustable waxed cotton cord with solid brass detail.